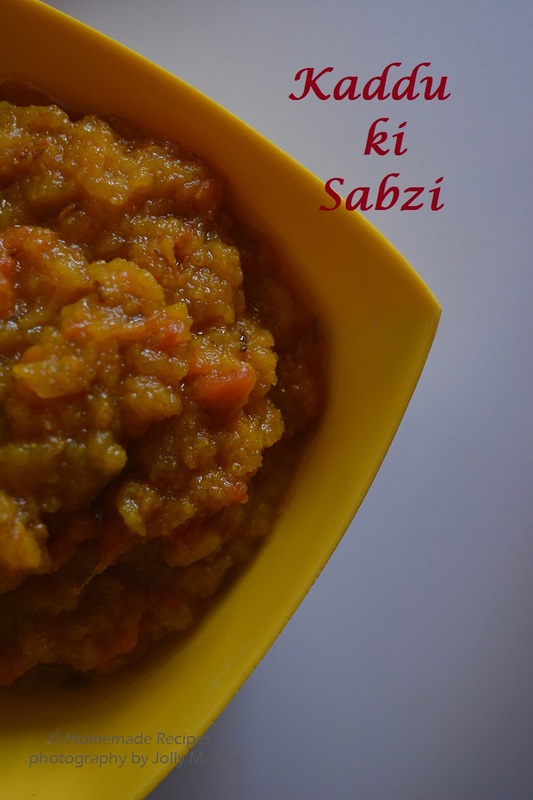 How to make Pethe ki Sabzi Recipe with step by step process >> This is a simple and easy Indian style recipe of yellow pumpkin which is seasoned with whole spices and cooked in ghee made this sabzi everyone’s delight. This is purely punjabi style dry pethe ki sabzi that made most of the times at my home. 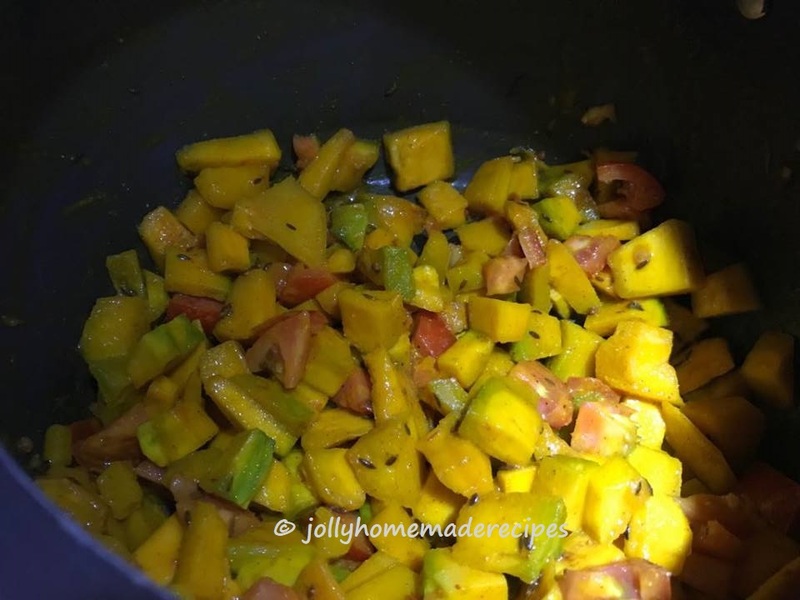 Kaddu is also named as Indian yellow pumpkin or Sitaphal or Petha is a vegetable that is cooked in almost every Indian homes but with different style. Though it is a popular Punjabi dish but there are many different versions of making it across India. Petha is the most popular vegetable used during fasting times. As for the healthy concern, this vegetable is rich in protein, iron, calcium and low in calories. This is a good choice for diabetic patients and diet conscious. This is really such a cozy and comfort food. This dish is best to have with pooris. I simply love this dish because of its simplicity and taste. I have learned this recipe from my dadi(grandmother) who cooks excellent Punjabi food. 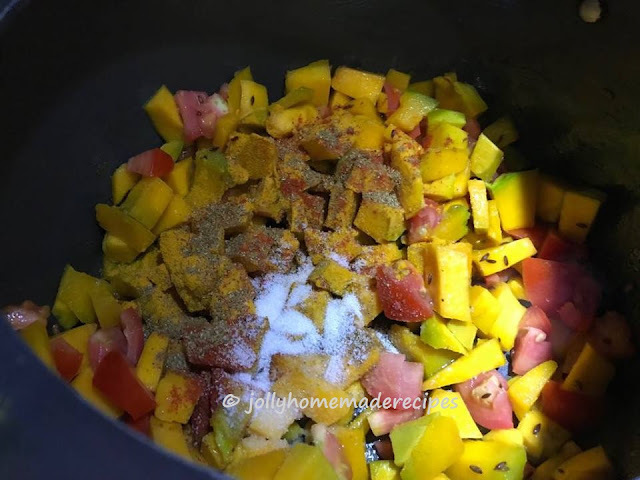 In the below recipe, I have used yellow pumpkin which was sweet and ripe. 1. You will need a round pumpkin with light yellow skin and from yellow inside. Remove the seeds and peel off its skin. Chop it into very small pieces. Set aside. 2. 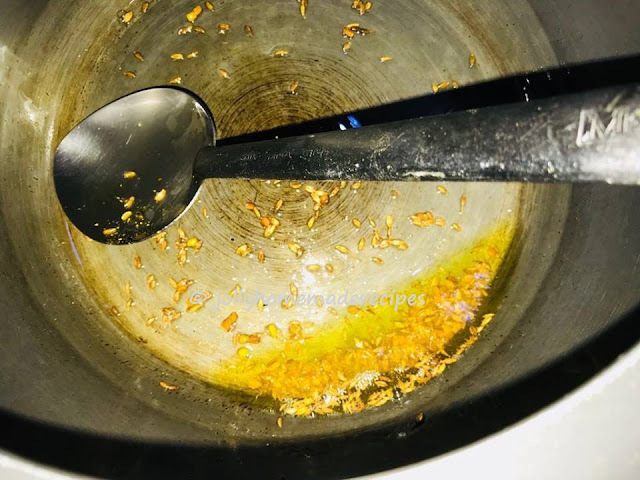 Heat ghee/oil in a pressure cooker, add the fenugreek seeds, chopped green chillies, cumin seeds and fry for a minute on a low flame. and add all the spice powders except garam masala and dry mango powder. 4. 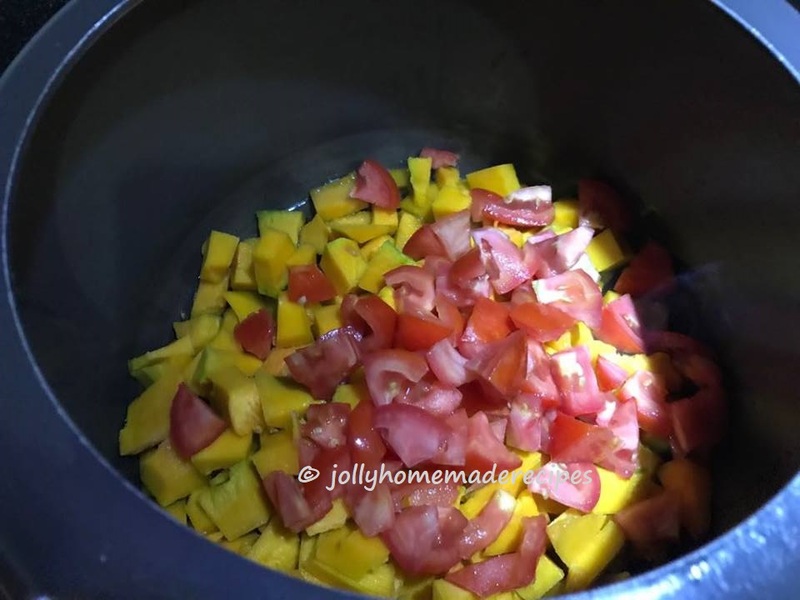 Cover the pressure cooker with a lid and pressure cook for 1 whistle on a high flame and reduce the flame for 10 minutes till they become soft and mushy. 5. 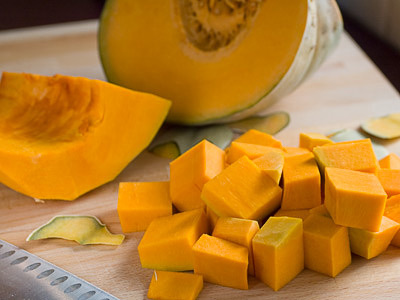 Now open the cooker, mash the cooked and soft pumpkin with the back of spoon, let the water dry out and then add sugar. 6. 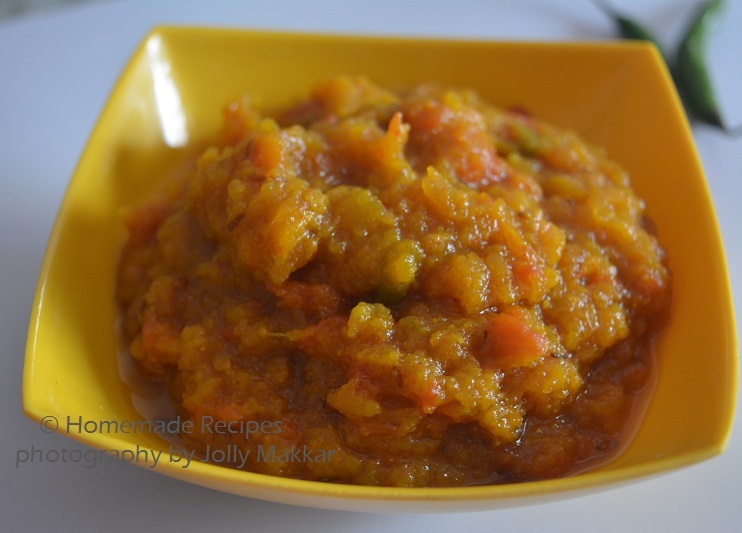 Stir the mashed pumpkin well and cook for minute or two. Lastly add the garam masala and dry mango powder. 7. Petha sabzi is ready once all the water is dried up, garnished with coriander leaves. Serve hot kaddu ki sabzi with roti or poori, pickle and onion as a side salad. 1. If the sabzi still looks watery to you, then dry the water from the sabzi by cooking it without the lid. 2. For vrat food substitute regular salt with sendha namak (vrat salt) and skip the fenugreek seeds, turmeric powder and garam masala or tomatoes(many people eat tomatoes during fasting or many not). Great recipe Jolly. I love sweet and sour pumpkin but with dry mango powder. Never tried with tomato. Bookmarking it. 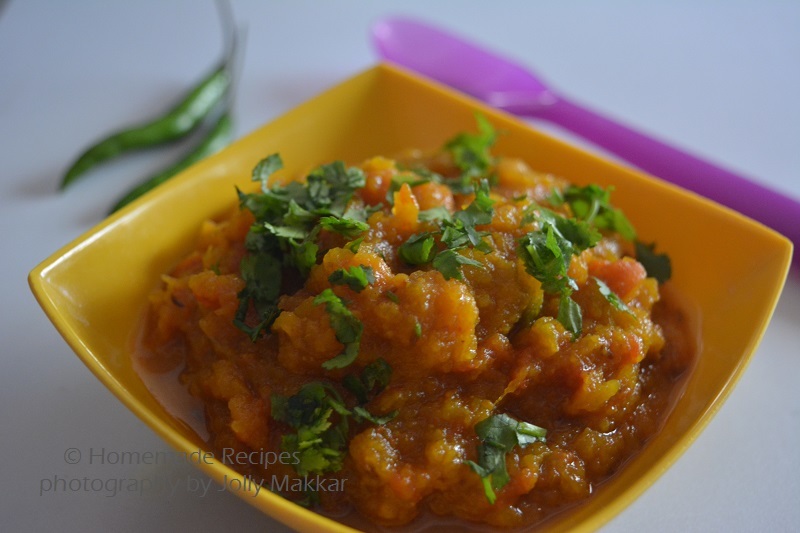 Not made pumpkin sabji with tomato and amchur. I usually make it the way my mum use to..dry. Bookmarking this recipe to try out. Jolly did you change your logo??? Looks pretty. It looks divine dear. very nicely explained!! Ages i had this sabzi, seriously my mouth is watering here. Sabzi looks absolutely irresistible and ultimate, fingerlicking goodness. Bookmarking I make kaddu often n need a new recipe. Sounds yummy. I love this sabzi as breakfast with Missi Roti or Plain Parathas but my husband loves it with Pooris which is the apt choice. Grandmothers recipes are such a treasure and I bet this is delicious. This is usually served at all punjabi weddings too along with a wide variety of gravies and sabzis. Love it. I love kaddu and normally I make a stir fry. 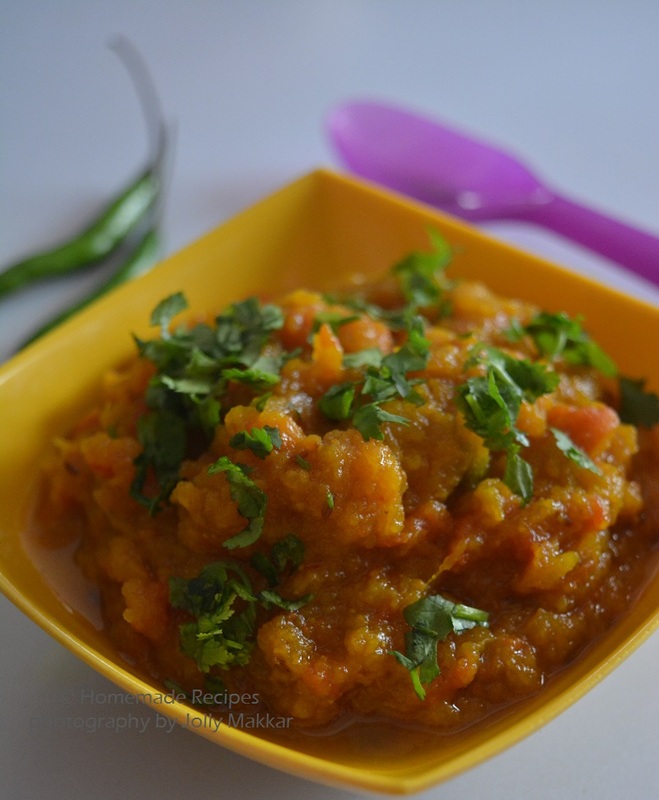 This mashed curry looks delicious and would taste great with puris. There is something about mashed curries that I cannot resist and you have used one of my favourite vegetables here so you are tempting me. 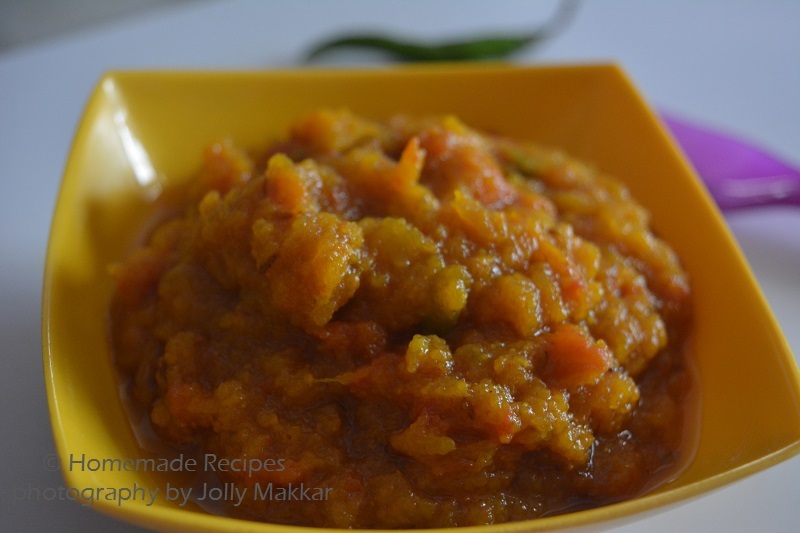 Lovely recipe must taste good paired with roti, puri or Parathas. I mostly used kaddu in soups and cakes. Never tried sabji. Will try your version! This recipe is new to me.. I love pumpkin and loved your version. will try sometime ! I too make kaddu ki sabji, but don't add tomatoes. Sounds delicious and easy recipe. I love pumpkin recipes. This sabzi looks delicious. That is a lovely recipe with pumpkins. yummm. We love kaddu sabzi Jolly and make it almost like you did but sometimes add raw mango instead of amchur powder. Love to finish it with poori. Lovely pumpkin recipe. Nicely explained. I love yellow pumkin in any recipe....This sabzi looks yummy...simplicity at its best...Yummy share! !